Metabolomic characterization of food/beverage products is increasingly used for assessing food quality. To interpret the data fully for actionable outcome, simplifying data acquisition and multivariate analysis into a standard analytical workflow is needed. Recent advancements in analytical techniques have now enabled simultaneous quantitation of numerous compounds that constitute the foodstuff for quality evaluation. The purpose of such a comprehensive analysis is to identify and monitor key features that may be attributed to favourable taste, rich odour and freshness. GC-MS/MS is an extremely robust, reproducible and sensitive methodology that has the capability of resolving and identifying hundreds of small molecules. 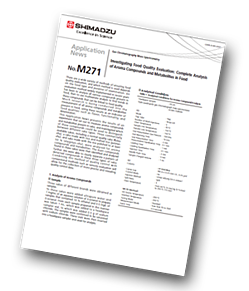 In this application note, a wide range of target molecules were covered by using two analytical methods; volatile, aroma-related compounds were directly measured by head-space injection, whereas other hydrophilic metabolites were analysed after derivatization by MSTFA. Samples of the three sake types were labeled as futsushu, junmai-shu and daiginjo-shu. Taking the results from analysis, peak identification was performed based on the NIST 14 library and quantitative ions, reference ions, and retention indices mentioned in previous articles.1 Principal Component Analysis (PCA) was performed for the 138 compounds detected in all samples. A score plot of this analysis is shown in the figure opposite. The three different sake types are clearly separated on the score plot. The power of this methodology was demonstrated through the analysis of Japanese sake. Japanese sake brands are commonly classified by their manufacturing process and grade. 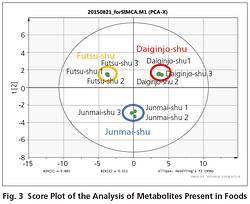 Metabolomic profiling successfully resolved the sake brands in accordance with their classes, while at the same time identifying the compounds that are attributed to each class. 1. Natsuki Mimura, Atsuko Isogai, Kazuhiro Iwashita, Takeshi Bamba, and Eiichiro Fukusaki, Gas chromatography/mass spectrometry based component profiling and quality prediction for Japanese sake, Journal of Bioscience and Bioengineering, Vol. 118 No. 4, 406e414 (2014).